This article is 2800 days old. 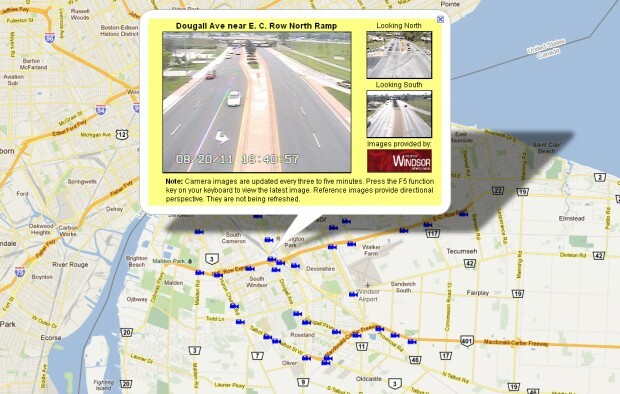 Windsorites can now check out local traffic conditions before they even leave their homes. The Ontario Ministry of Transportation has made many of Windsor’s various traffic and intersection cameras available online for all to view. Windsor’s traffic cameras are mostly available in various busy neighbourhoods and areas and are confined to important intersections and roads such as Tecumseh, Huron Church, Wyandotte or Lauzon. Online traffic cameras have been popular in Toronto and the GTA since the 90’s when the first “COMPASS” cameras were installed, and the MTO has been slowly rolling out online visibility of cameras throughout the province as part of an open data initiative. Windsor’s cameras went online this week for the beginning of construction on the Windsor Essex Parkway and demolition of the North Talbot Road bridge.